WARNING: This post will contain spoilers for Avengers: Infinity War. If you have not seen it yet and don't want to be spoiled, leave this post and come back later. As I mentioned in my spoiler-free review, I had strong feelings about a lot of the characters in this film. Whilst most of them got little screen time, they all got enough time to show their development. Some stayed true to this, and some I feel were a complete let-down. I am going to break down in this blog post who I loved, who I felt disappointed by, and those who passed away. Thanos: This is truly his movie and he is not afraid to let the audience know that. I was wondering how they would show his strength, but they do so immediately by facing him against the strongest person possibly in the MCU, the Hulk. Thanos goes through a lot of character development, and all the way through we see his motive. He truly believes that he is doing the right thing, and goes through grief and suffering to get to where he thinks he needs to go. The film perfectly shows him with all six stones, which I knew they would have to do. I have absolutely no idea what will happen to him in part two, or how he will be stopped. That makes for a great villain. Groot/Rocket: We know from the first two GotG films that there is a buddy movie waiting to happen with Rocket Raccoon and Groot. Their comedy is fantastic, they are stronger together and have been through everything possible. The best part that they have in the film is indeed the humour. However, they both give great sequences as well. This comes in the form of Groot helping create Stormbreaker by making the handle, and Rocket continuing his gag of wanting body parts by wanting to buy Bucky's metal arm. They both hold themselves in the battle at Wakanda as well. It will be interesting to see how they balance this friendship in part two, seeing that Groot disintegrated whilst Rocket did not. Scarlet Witch: Scarlet Witch is the one character in this film that doesn't suffer from having to be weakened in terms of power. In fact, I think she is almost too strong. Her powers need to be refined to give her a selected set like Doctor Strange. Aside from that, she alongside Thor have the most to lose from this war and she goes through some emotion. My heart broke for her when Thanos came, having to watch the person she loved come back to life just to be ripped apart once more. I have loved Scarlet Witch since she first came on screen in Age of Ultron and I am hoping she will be sticking around for a while longer. Thor: When the Russo Brothers were doing press junkets, they pointed out that Thor is the second biggest character in this film alongside Thanos. Having seen this film, you know why. Sure, his story isn't the most exciting, but it is necessary and it is nice to see the passion behind what he is doing. The start gives him motivation, and to see him losing his brother and best friend within the first few minutes is so powerful. 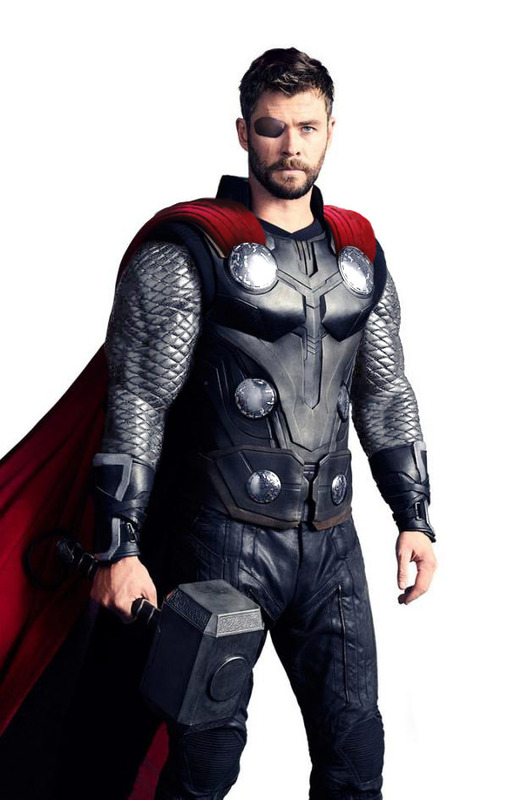 Ending with a big bang, Thor is at the top of his game right now following from Ragnarok. Okoye: Coming off from Black Panther, I thought that perhaps T'Challa or Shuri would play the biggest part in Infinity War, but somehow Okoye got the best lines and action from Wakanda. Not only was she hilarious (the joke about Scarlet Witch was one of the best in the film), but she showed off her strength and power and overall, whilst she never stood out to me in the Black Panther film, she came into her own in this film. She also got to survive the disintegration, so it will be interesting to see her mix with the original Avengers team come part two. Star-Lord: Out of every character, when I watched the film for the second time it was Star Lord that really annoyed me. The main scene that frustrated me was the moment when he found out Thanos had killed Gamora. Sure, you never know how you will react when your loved one dies. But to put the entire Universe potentially at risk seems very stupid to me. He made the plan, he knew what role he had to take, and he jeopardised all of it to lash out. He could have waited a few more seconds, and all could have been good. He just seemed to act out of character, and I wish he was just that bit smarter in this film. To make fun of Iron Man and Thor, then act like a little kid when something doesn't go the way he wants, seems a little bit idiotic of Star-Lord. Captain America: What disappointed me about Captain America wasn't what he did, because that was fine. It was that he had very little to do. Every scene he's in, he could have been substituted and it would have made little impact. He had a lot of heroes surrounding him and he simply just didn't get enough screen time to make a lasting impression. The Hulk: I'm just going to say this, I don't like the fact that the Hulk was afraid to come out. Yes, they needed a way to keep the Hulk away from Thanos as he is one of the only people who could beat him in combat. To scare him away though seems like a development move that shouldn't exist with the Hulk. A more effective way would have been just to kill him off in my opinion. There is no point in Bruce Banner being there if he can't release the Hulk into battle, regardless of the Hulkbuster costume that seems to break way too easily. Drax the Destroyer: Sure, he is a comedic genius. He is a lovely character that fits well with the dynamics of the Guardians. However, what does he really bring to the battle? With Thanos ruining his home by taking half of his life away, you think he would be a bigger player to the team. I felt his presence really lacked during the battle scenes, and overall there are other comedic characters that can easily take his place and overpower in the battle scenes. He just feels like a filler character in this film. Heimdall: The least impactful of the deaths, Heimdall was a smaller character who I feel nobody considered when making a death list. Out of the Thor franchise, there were other characters like Valkyrie who wasn't even mentioned who would have had a bigger impact. It didn't seem to matter anyway as the next character had a bigger, more impactful death to Thor and Asgard in general. Loki: This is a death I feel everyone predicted. Not only has his character gotten a little sloppy since they tried to turn him good, but a death like this would be the push Thor needed to go after Thanos. This was a simple decision to make, and Tom Hiddleston should be proud of the role he has played in the MCU. I love Loki as a rebellious character, but he should have stayed like that for me. Gamora: Once again, another predictable death but this one felt necessary to the storyline. What annoyed me is that this felt like the character was being "fridged". Essentially, what fridged means is that a female character dies simply to drive a male's story forward. This is exactly what happens here, but there was no other way around it. What was sad was that a lot of people had cool ideas about the location of the soul stone, and this was the reveal. The coolest part of the reveal was Red Skull. There is the issue of some people not buying that Thanos loved everyone, but there is also the problem that Gamora was a bit stupid and not being cautious of his love for her. Either way, I think her death is permanent and Nebula or Mantis will take the female lead in GotG3. Vision: If someone didn't predict Vision's death, then they were simply too optimistic for the character. This death was inevitable. I am glad that Marvel addressed the solutions that were possible, such as Shuri removing the stone. This death was the most emotional for me. This comes down to a few reasons. First of all, I have expressed my love for Scarlet Witch and after seeing her brother die, I didn't want her to lose the only other person she loves. Secondly, this was the one with the highest stakes. It was the final stone that Thanos needed to complete the Infinity Gauntlet. Thirdly, he died twice within split seconds. The Russo Brothers built up our excitement of seeing Scarlet Witch succeed, just for the disaster of the time stone to erase all of her work, watch her face as she realises that it is too late. This was the best sequence in the last third of the film by far and away. The Disintegrated: This is the major issue with the last sequence of the film: it is not permanent. I want Marvel to commit to deaths, but in this sequence they seem to choose almost all of the characters who are guaranteed to live. At first, I was getting sad because my favourite character Bucky Barnes was disintegrating. But then, we see Black Panther going and I almost got mad. There is going to be a Spider-Man 2 and Black Panther 2, so to see both of those characters eliminated all the stress and worry from me which created a weaker impact than I wanted. I have no idea what is going to happen in Part 2, but my thoughts have to go back to Doctor Strange. He disintegrated, so he must have a plan to create the one outcome that gets the Avengers the win. Those are the characters that I specifically want to highlight in this post. I may have missed out some big characters, but that will be because they did what I expected them to. What do you guys make of my character analysis? Do you agree that Thanos was the best character in the film, or do you think I'm being too harsh on Star-Lord? Comment below, I love to hear your guys opinions! Until Wednesday (where I will be updating on two weeks worth of film watching), that was some film for thought.